Background. IgG4-related disease (IgG4-RD) is a fibroinflammatory condition. T-cells play a crucial role in the pathogenesis, and therefore, serum soluble interleukin-2 receptor (sIL-2R) may be a potential biomarker. Method. We studied the levels of sIL-2R in 26 histologically proven IgG4-RD patients with available serum sIL-2R and compared them to those in newly diagnosed and untreated sarcoidosis patients (n = 78) and controls (n = 101) and the serum sIL-2R levels in patients after treatment of IgG4- RD (n = 15). The disease activity was measured using the IgG4-Related Disease Responder Index (IgG4-RD RI). Results. Median serum sIL-2R in IgG4-RD patients was 4667 pg/ml compared to 1515 pg/ml in controls (P < 0 001) and 6050 pg/ml in sarcoidosis patients (P = 0 004 compared to IgG4-RD). All IgG4-RD patients had elevated serum sIL-2R levels compared to the reference value of < 2500 pg/ml in controls and 85% elevated serum IgG4; however, these did not correlate with each other. Both serum sIL-2R and IgG4 levels declined significantly after treatment (P = 0 001 and P = 0 01, resp.). Before treatment, serum sIL- 2R level and IgG4-RD RI did not correlate with each other. 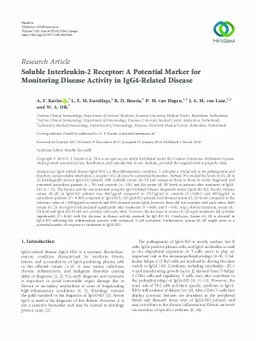 However, the decrease in serum sIL-2R upon treatment did correlate significantly (P = 0 04) with the decrease in disease activity assessed by IgG-RD RI. Conclusion. Serum sIL-2R is elevated in IgG4-RD reflecting the inflammatory process with enhanced T-cell activation. Furthermore, serum sIL-2R might serve as a potential marker of response to treatment in IgG4-RD.